The following information is subject to change and are not official release dates. 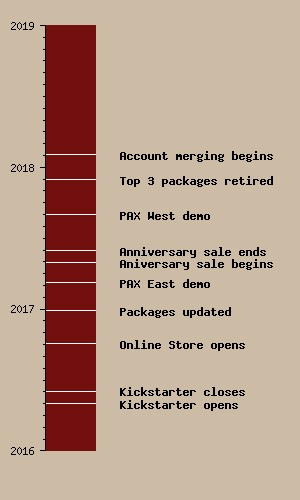 The 'estimated' dates are current as of July 27, 2017. Kingdoms of Elyria: Uses the Prelyria client and allows people to play remnants of the past, their ancestors, to help test some functionality and also to help build on the recent history (Previous 52 years). Access to Kingdoms of Elyria requires a paid package - any package, from Elyrian all the way up to King. Exposition: Uses the UE4 client and takes place slightly before official launch. Access to Exposition requires a Bloodline Package or higher. Alpha testing is intended to be functional testing. The focus here is on game-play mechanics rather than bugs. It is an opportunity to validate the game as fun and make changes as necessary to ensure the best possible design. Alpha 1 focuses on the adventurer tier. The mechanics here will focus on survival, exploration, combat, and crafting. Basically, most of the features that adventurers are likely to use. Alpha 2 focuses on the gentry, aristocracy, and nobility tiers, with mechanics such as land management, housing and settlement building, and domain and kingdom management. Beta testing is about finding bugs and ensuring as smooth a launch as possible. Beta 1 is about finding bugs unrelated to stress or latency. The focus will be on UI/mechanical bugs that are not time-critical, such as crafting, settlement and domain management, survival, etc. Beta 2 is about finding bugs that are related to stress or latency. The focus will be on combat and other high-action activities. February 12, 2018 - The first batch of the V3 website game guides published. December 28, 2016 - Online Store updates with new backer packages. Funding for stretch goals ends. Note: Packages were adjusted slightly later, based on community feedback.